Price: 750 euro / pax on half twin basis. Supplement for single accommodation: 90 euro / pax. July 18: Airport – Bishkek city (30 km). Dinner, “Asia Mountains” Hotel 3*. 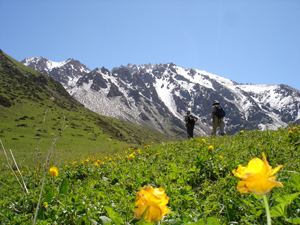 July 19: Excursion to Ala-Archa Natural park (40 km one way). Easy hiking. Lunch picnic. Bishkek sightseeing tour: Ala Too Central Square, State History Museum, White House, Parliament House, Lenin Statue, Change of Guard of Honor, etc. 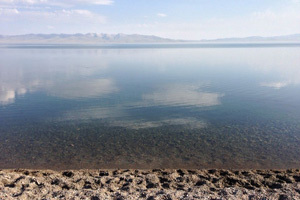 July 20: Bishkek city – Son Kul Lake (360 km). Today we reach the high altitude Lake where the local nomads graze their flocks of sheep and herds of horses. 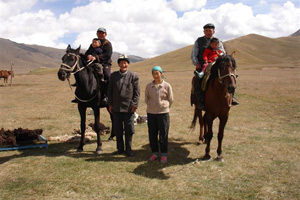 It is a nice opportunity to meet nomads, learn more about their life and take photos. Lunch en route. Dinner and overnight in a yurt camp. July 21. 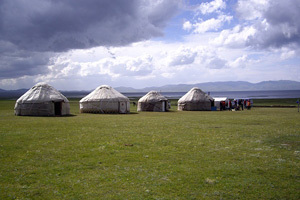 Son Kul Lake – Baetovo village - Tash Rabat Carawanserai (160 km). Drive over several mountain passes with stunning views. Lunch picnic. Excursion to the Carawanserai. Hiking opportunity. Dinner and overnight in a yurt camp. July 22. Tash Rabat Carawanserai – Naryn town – Kochkor village (230 km). Lunch in a local cafe or family. In Naryn we visit the Central mosque, central square and art gallery (if it is open). 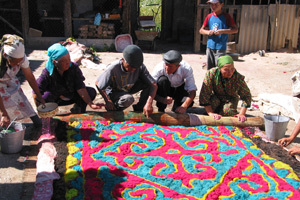 In Kochkor we see – felt shop and handicraft museum. Dinner and overnight in the houses of local people. July 23. Kochkor village – Fairy tale canyon - Karakol town (270 km). 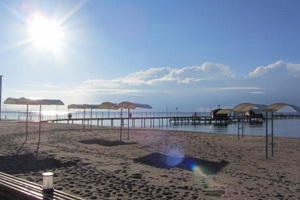 Drive along the Southern shore of Issyk Kul Lake, the second largest high mountainous lake in the world after Titicaca. Hiking and photo opportunity in the Fairy Tale gorge with unusual red sand rock formations. Dinner in a local Dungan or Uigur family. Overnight in “Green Yard” guesthouse. July 24. 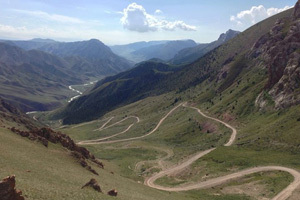 Karakol – Cholpon Ata town (150 km). Karakol sightseeing tour: Dungan mosque, Russian Orthodox cathedral, Przhevalskii museum. 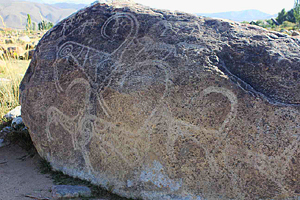 Cholpon Ata Petroglyphs site. Lunch en route. Dinner and overnight in a hotel on the lake shore (“Royal Beach” or similar). July 25. Cholpon Ata town – Bishkek city (280 km). Drive along the Northern lakeshore to Bishkek. En route we stop for an excursion in the historical com plex “Burana tower”. Lunch in a local family. Dinner in a local restaurant. Overnight in “Asia Mountains” Hotel. July 26. Bishkek city – airport (30 km). Breakfast and airport transfer.